When visiting the Kailash temple in the silence before dawn, one can’t help but bow down to the ones who designed and carved this majestic reminder of an unknown past. As it is still dark, it is not the time to wander around and see what is there for the physical eye, such as the enclosing high walls of rock, the beauty and perfection of the structures of the shrines, the many statues of Vedic deities and celestials, the panels of the Ramayana and Mahabharata, the rows of elephants, lions and makaras, the powerful lion-like sharduls or the water pots topping the temple roofs. All this is for later in the day. Now, before noisy tourists, screaming school classes and groups of pilgrims come, is a time to go upstairs to the holy shrine, leave the senses behind to feel the REAL and communicate in solitude with what is beyond the mind. Entering the Mandapa, in front of the Hiranyagharba, the Sanctum Sanctorum, is like entering another world. The sixteen massive pillars, set in perfect symmetry in groups of four, stand in majestic command, glowing from an Inner light. Whispering voices tell to circumambulate these pillars from left to right as though circumambulating the Universe and read the symbols, carved into each of the four pillar sides. Nothing is meant just as decoration, all bears a message to tell. But – how to read it? Only the heart can do so. For an analysing mind, the symbols remain just that. What if the heart is not open or not open enough? There are keys, some are easy to find, others are only for the Highest of women or men, waiting to be opened at a time when mankind is ready to understand, accept and realise a new era of Life. One of the keys is easy to get. The Kailash temple is not built. 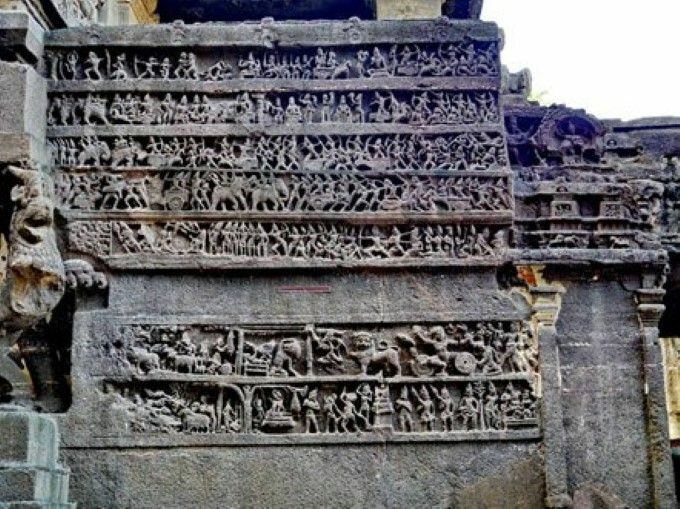 All is cut and carved from ONE single piece of rock, hewn out of the Charanandri hills of the Sahyadri range of the Deccan Plateau at a village, which once was called Elapura, now it is known as Ellora, 30 km northwest of Aurangabad. Nothing of the original temple was brought in from outside. All was created out of One, all is part of One. Nothing stands by itself. All is a symbol of the functions of creation. 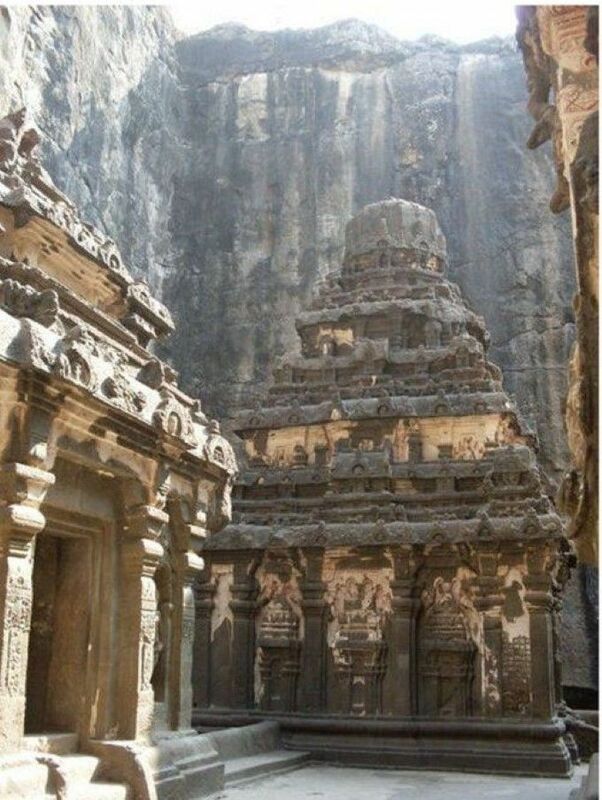 The Kailash temple is not just one of the many ancient sites the ancestors have left in what is India today. Officially it is a Hindu (Brahmanic) temple but it is more than that. It may well be one of the holiest sites on earth, a keeper of wisdom from long ago, a preserver of the lost knowledge of life. It is there for all who come and want to learn. Though this temple, its structure, design and carvings have been altered many times, the original message survived, guarded and protected by scores of angels, which are seen hanging in reliefs on the temple walls, surrounding the sculptures of deities or feel them as etherical beings when they come in the silence of the night to keep the cosmic functions alive by singing their songs of creation. Angels are all over Maharashtra’s ancient sites, but nowhere else are so many in just one place. Is this why the Kailash temple is open to the sky? There are many more temples at this Ellora site, all next to each other; thirty four are open to visitors. Some are Hindu, some are dedicated to Lord Buddha and some to Mahavira, the founder of the Jains. 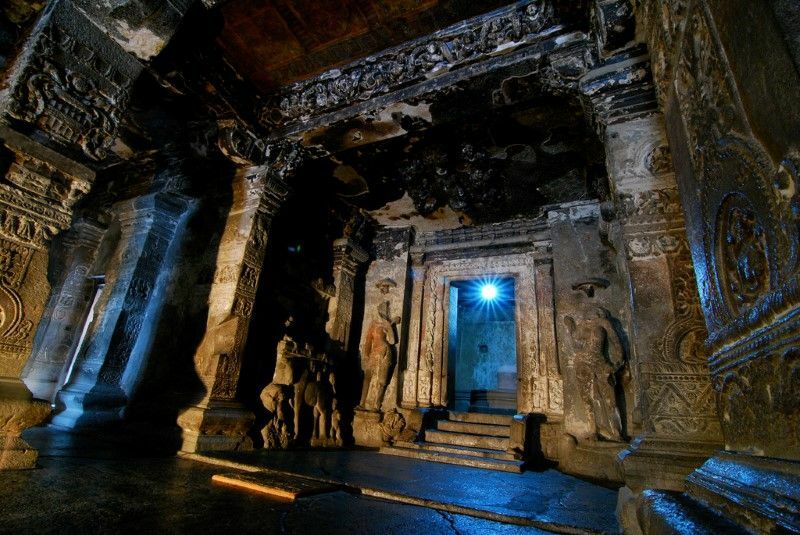 But unlike the Kailash temple, they are caves, hewn out horizontally, open only to the front (except for another smaller temple of the Jains). The Kailash temple was cut from the top down in a U-shape form, about 50 Meters deep in the back and sliding to lower levels on the sides to the front where there is the entry gate. Cut with what? With hammer and chisel? There are chisel marks along the walls of the rocks, but spiritual masters say, the chiseling was done long after the rock walls were cut and the original temple created. Were the chisels just use to straighten and smoothen the sides and carve out new galleries and caves in the enclosing walls? The mystery remains. How was it possible to cut down straight into this Basalt rock, dig a broad trench and leave a huge piece in the center out of which the temple shrines were carved, ten altogether? That these rocks are full of crystals may be part of the answer. Could it be there once were technologies, using crystals not only to hold information as they now do in computers and mobile phones, but turning their vibrations into energy to cut rocks as hard as Basalt? Many of the visitors who come today, can still feel the strong energy, as though their bodies are batteries being charged from the ground. Geologists and physicists, who are breaking out of the restrictions of conventional thought have started to experiment with such techniques. They may be rediscovering the past. The ten temple shrines are set in one line, all on the upper floor, which one reaches through a narrow set of stairs. One starts from the shrine above the entrance gate, which once held the big drum, and goes on to the shrine where the mount of Lord Shiva, the Nandi (Bull) sits all by himself. From there, one walks on to the small porch in front of the pillared mandapa, and then passes through this mandapa to the Sanctum Sanctorum – the small, square, dark and undecorated place, where the holy symbol of the Formless rests. For the Hindus, this is the Shivalinga, Buddhists can see it as a symbol of Sunyata, the realm beyond form. For others, it is whatever they feel. Above the Sanctum Sanctorum rises the Shikara into the sky, aligning the earth with the Universe. All these shrines are connected by bridges from one to the next, symbolising that all depends on all. The entrance gate lies to the West, so that one walks the shrines by facing east. Then there are another five shrines, surrounding the Sanctum Sanctorum in a semicircle on a platform outside.